Greeting your horse this way really does make a difference! Find out more…. 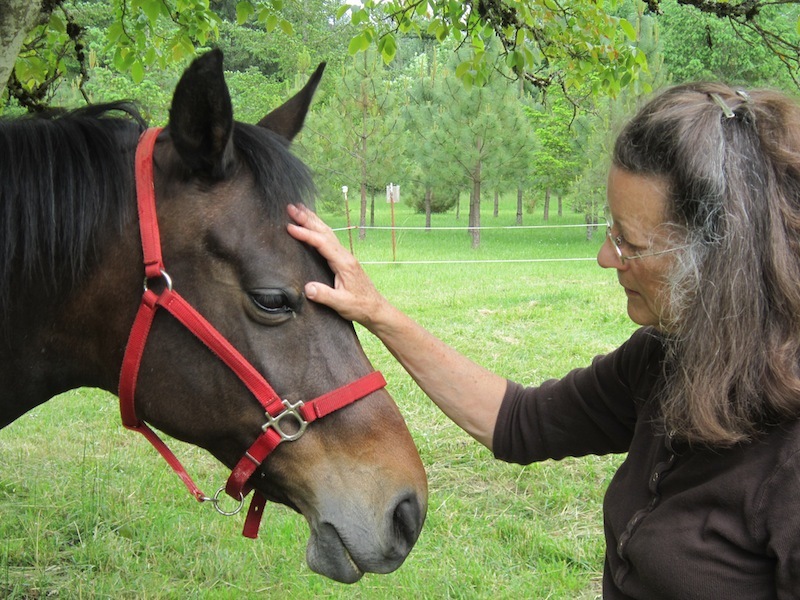 Maggie: As featured in the photo, This kind, thoughtful mare puts more try into understanding this new greeting. She begins by connecting with my hand, and stays there just for a bit. I stop and then tell her she’s a lovely horse, and begin to turn away, but she lowers her head and seems to ask for more. Lexi: She seems a little confused, and disinterested. She’s not really interested in figuring what this is all about right now. She usually is curious about something new. She turns her head, or raises it. Not really wanting me in her head space. Scottie: Today I thought of doing this as an acknowledgement, just a “How do you do”. I also made an effort not to make my body language seem forced, but quieter and interested in him. I kept a soft smile on my face and try not to project any intensity. He held his head still, and I just made one downward stroke down his face, said “thank you” and walked away. I think he was a bit surprised.